Quang Ninh is a large province located along the northeastern coast of Vietnam. The province is home to Ha Long Bay, a World Heritage Site. The provincial capital is Ha Long. Nearly 80 per cent of the province is mountainous with abundant land, forest water and mineral resources. Nearly 90 per cent of coal output in the country is extracted in this province. 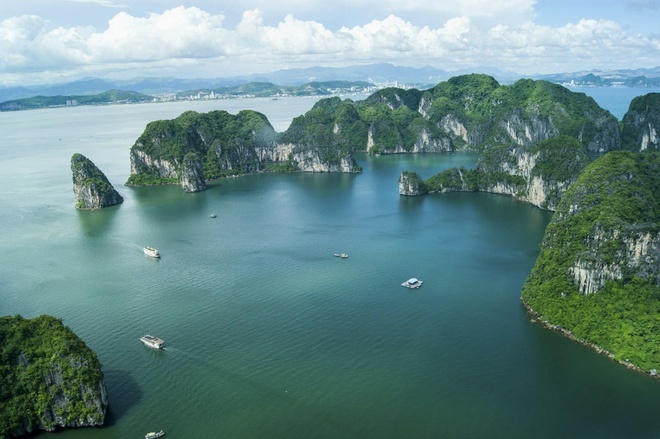 Ha Long Bay has 1,969 islands, out of which 989 have been given names. The province is seen as a miniature Vietnam because it consists of sea, islands, plain, midland, mountain and border. As planned, Quang Ninh belongs to key economic region of both Northern region and Red River Delta. This is a major coal mining province of Vietnam with Ha Long Bay, the natural heritage and natural wonders of the world. Quang Ninh is a land with long-standing culture. Halong culture is considered as milestone of the evolution of Vietnamese people. Like other provinces, people living in Quang Ninh culture is very rich and diverse. Buddhism appeared in this land very early. Before King Tran Thai Tong (1225 - 1258) practiced Buddhism in Yen Tu Mountain, many religious men had practiced here. Kinh Tran Nhan Tong (1279 - 1293) chose Yen Tu as the place to practice and establish Truc Lam Buddhist Zen in Vietnam. In the 14th century, Yen Tu and Quynh Lam (Dong Trieu) is the center of Vietnamese Buddhism practicing monks for the whole country. Through many centuries, Buddhism has still existed with hundred of pagodas in Quang Ninh, including famous pagodas as Loi Am, Long Tien (Halong), Linh Khanh (Tra Co), Ho Thien (Dong Trieu) and Linh Quang (Quan Lan). Through many ups and downs, the destruction of nature and human beings, Quang Ninh currently remains appropriately 30 pagodas scattered in 8 districts, towns and cities. People worshiping other religions are not as crowded as Buddhist devotees. The common belief of Quang Ninh people is ancestor worship, Generals of Tran Dynasty worship and Tutelary God, Gods (Water God and Mountain God), Holy Mother (Lieu Hanh, Thuong Ngan, Mau Thoai). Quang Ninh is a province rich tourism potential, one of the top tourist destinations of growth tourism triangle in North Vietnam. The province owns Halong Bay - the world natural heritage and world heritage site thanks to its geological and geomorphological value. Halong Bay is an ideal destination in Quang Ninh as well as the North Vietnam. Halong Bay is one of 7 natural wonders, natural heritage in the world with the area of 1553 square kilometers and 1969 islands. In which, the world heritage site recognized by UNESCO has the area of more than 434 square kilometers with 788 islands which have special value of culture, aesthetics, geology, biology and economy. In the bay, there are many earth islands, caves, beaches and beautiful landscapes favorable for tourism development. Bai Tho Mountain – a 106-meter high limestone mountain is located in the city center of Halong, adjacent to Halong Bay. The name “Bai Tho” of the mount originated from this legend. In 1729, Lord Trinh Cuong composed a poem in parallel with King Le Thanh Tong’s and the poem was carved next to the king’s poem. Standing on Bai Tho Mountain, visitors will be surprised at the breath-taking beauty of Halong Bay. You will see images of boats afar on the deep blue sea with the rocky mountain, the sky and the surrounding plants and flowers. Bai Tho Mountain is a beautiful spot in Halong Bay. Long Tien pagoda built in 1941 is the largest pagoda and a famous scenic spots of Halong City. The pagoda is located under the foot of Bai Tho Mountain, near Halong Market, in Long Tien Street. Its architecture was based on the early Nguyen dynasty’s architectural style, the style of "chong giuong gia chieng", patterns of dragon and phoenix and stylized flowers. On the hall’s rooftop, it is a porcelain statue with images of dragons flanking the moon. At the two sides of the hall are 2 parallel sentences. The main palace is where Sakyamuni, Bodhisattva of Mercy and other Buddhas are worshiped. The right palace is for worshiping Tran Hung Dao and the left palace is for worshiping of Tam Phu Mother Goddess. Long Tien Pagoda festival lasts until the end of the 2nd month of the year, attracting many visitors. People come here to pray to "Tran Deity" for good fotune. Yen Tu relic consists of a system of temples, pagodas, towers and old trees blended with the natural landscapes scattered from Doc Do to Yen Tu Mountain, Uong Bi city, Quang Ninh. Traveling Quang Ninh, tourists will have the opportunity to immerse into the unique and diverse festivals stretching from east to west of the province. Each festival brings tourists experience and deep sense about the simplicity and warmth in the cultural and spiritual life of people in the northeast region. Mentioning to Quang Ninh festivals, we cannor but mention to festivals as festival in Da Village (Thanh Lam commune, Ba Che district), Long Tong Festival (Ba Che district), Luc Na Temple Festival (Luc Hon commune, Binh Lieu district), My Son Temple Festival (Phu Hai commune, Hai Ha district), cultural festivals of Dao ethnic people in communes of Dong Ngu, Tien Lang, Phong Du, Yen Than (Tien Yen district). In addition to their own unique features, festivals in Halong reflect the spiritual cultural life and material life of each ethnic group. Lasting in 3 spring months, Yen Tu Spring festival is the longest festival in the province. Especially, Quang Ninh festivals are held not only in spring but also year round. Besides traditional festivals, Quang Ninh currently attracts domestic and foreign tourists by new festivals as Halong Carnival and Halong Cherry Blossom Festival. Although Halong Cherry Blossom Festival is a new festival, it has appealed tourists by its own unique features. Halong Carnival held over the years has created its own cultural characteristics and become the trademark of Quang Ninh tourism. With its uniqueness, diversity of each region, the interface between traditional and modern features, the festivals of Quang Ninh increasingly express profound cultural beauty of the people here. Co To archipelago belongs to Quang Ninh province, is one of the most beautiful destination of the north Vietnam. Co To Island is 22 kilometers from land and can only be reached by boats.